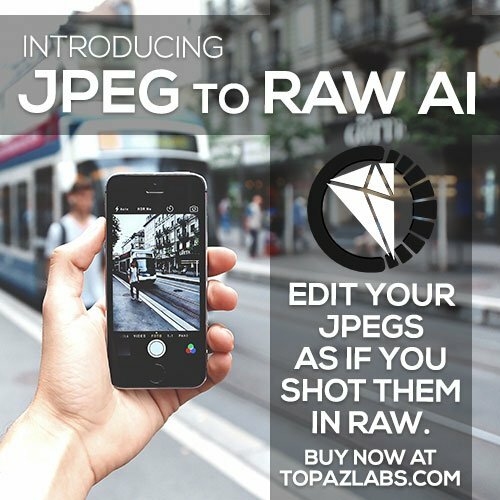 On1 Photo RAW is a photo-editing powerhouse. It can be used on its own, or as I prefer – as a Lightroom plugin. I use the first two tools above on every single photo I import into Lightroom, and the third on nearly every architecture photo. For me, On1 Photo RAW can’t take the place of Lightroom quite yet. However, it is worth noting that these features are expected in future releases of On1 Photo RAW. The tutorial below shows how I used Lightroom and On1 Photo RAW to turn this drab, underexposed snapshot into a captivating photograph. 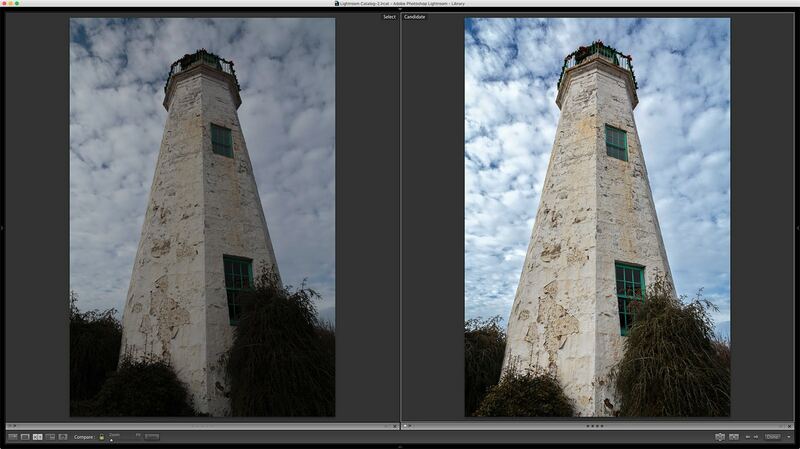 Since my import preset is applied on import, I start my processing with white balance and basic tone adjustments. Using the crop tool, rotate the photo to straighten the lighthouse and then crop slightly from the bottom left corner to center it. Already the photo looks a heck of a lot better. Next, I’ll jump over to On1 Photo RAW for stylistic effects. 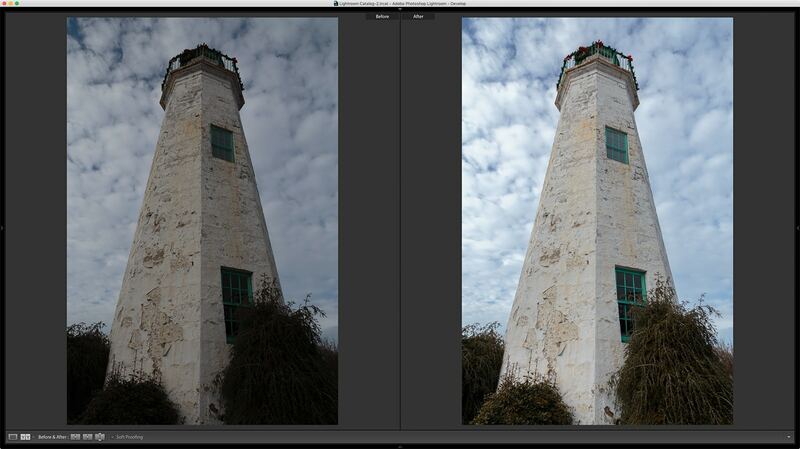 There are a couple of ways to access On1 from Lightroom. The most intuitive way (the way most plugins are accessed) is by right-clicking on the photo, selecting Edit In–> and then choosing the plugin. (You can also access the Edit In option from the Photo Menu). However, with On1, I suggest going to the File Menu –> Plug-in Extras –> and then selecting the On1 module you’d like to work with. This will allow you access to the Layers Module should you need it during your workflow. I won’t need Layers for this image, but I’ve made it a habit of choosing this method so that option is available if I decide to use it while I’m editing. For this image, I went to the File Menu–>Plug-in Extras–>On1 Effects 2017 and opened the photo as a Smart Photo. An On1 Smart Photo will preserve your edits non-destructively so you can go back and adjust them later. Once you are in On1, click on the button on the right side of the screen that says “Add Filter” to bring up a list of available filters. I almost always start with the Dynamic Contrast filter. When applying any filter in On1, I often click through the various presets to see which best suits the photo. In this case, I like what the Surreal preset does to the sky, but it makes the lighthouse and foliage in the foreground a bit too crunchy. With the help of On1’s masking brush and Perfect Brush I can selectively apply the effect to the sky without affecting other parts of the photo. For more information on masking in On1, check out this tutorial on the On1 website. Next, I added another Dynamic Contrast filter and chose the Soft preset. 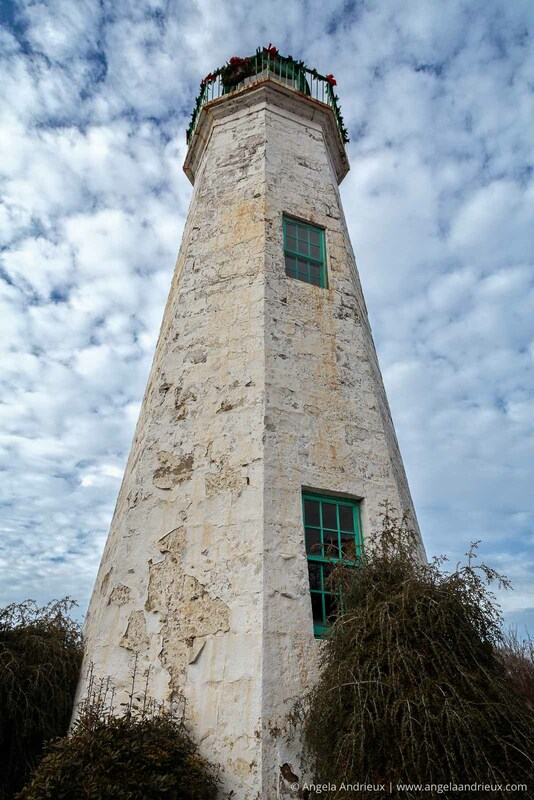 The Soft preset adds a nice amount of contrast and detail to the lighthouse but makes the sky and foreground foliage way too crunchy. To fix this I copied the mask from the previous filter, inverted it (which removed the sky), and then used the masking brush and Perfect Brush to remove the effect from the foreground foliage. I like the effect so far, but if you look closely the transition between the sky and lighthouse has a slight halo and looks a bit harsh. To soften the effect I’ll go back to the filter affecting the sky and lower the opacity to 65%. The photo was looking pretty good, but the lighthouse needed a bit more warmth. I added the Color Enhancer filter and chose the Warmer preset. I wanted the effect to apply only to the lighthouse so I copied the mask from the Dynamic Contrast – Soft filter and pasted it to the Color Enhancer. Next, I added the Tone Enhancer filter with the Dark Contrast preset to emphasize the patina of age. 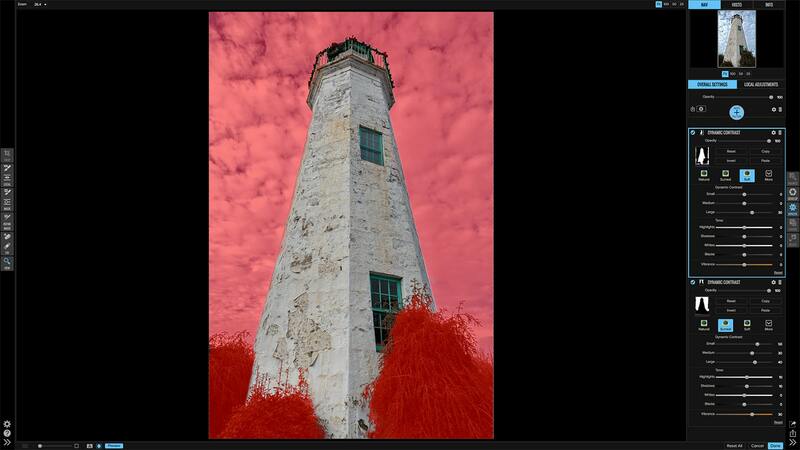 Once again I copied the mask from the previous filter to apply the effect to the lighthouse only. I really loved how this photograph was shaping up, but with the various adjustments we’ve made thus far it was looking a bit dark. To correct this I applied another Tone Enhancer layer, this time affecting the entire image (no mask) and increased the exposure by .2 to brighten the photo a little bit. My final layer was a vignette. I love the Big Softy preset. However, it was a bit dark for this photo so I decreased the opacity to 50%. Finito! At least with my stylistic edits in On1. I clicked Done and headed back into Lightroom. Once my edited photo was back in Lightroom I applied a small amount of sharping (+25 Amount, +60 Masking) and called it a wrap. I’m very happy with the finished photograph. With the help of amazing tools like Lightroom and On1 Photo RAW I was able to turn a so-so snapshot into a beautiful, striking photograph. I hope you enjoyed the walk-through of my Lightroom and On1 Photo RAW workflow. If you have any questions about Lightroom or On1 Software, please let me know! 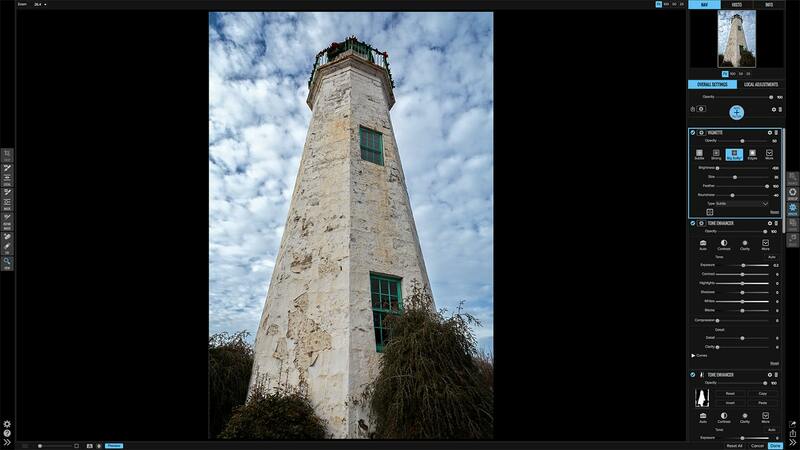 Easy Instagram Upload from your Mac with Uplet + Photo Contest!